I am working at TN Quilts in Jonesbrough, TN. What a great job. What a lot of temptation! I took new samples of my Flying Geese Placemat with Napkin Pocket to work. 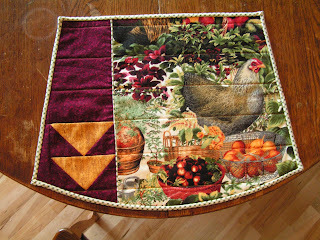 We sold out the fabric I had used to make the placemat. I also showed my prototype of a coordinating placemat for a round table and received a favorable response. So, this weekend I will be self publishing that pattern. A customer asked me to autograph the pattern! Look out, my head is swelling! I harvested the three stevia plants for the second time this summer. The individual leaves were put in the dehydrator and dried for sweetening our morning coffee. I plan to bring the plants in for the winter and see if they make it until next spring. I crushed about an eighth of a teaspoon full of stevia ( which is 10 times sweeter than white sugar) and put it in one fourth cup of cream. I warmed the mixture in the microwave for 20 seconds. Then strained the cream into my morning cup of coffee. It was just enough to take the bitter edge off the coffee. This weekend is the National Storytelling Festival in Jonesborough, TN. It reminds us of how important this oral tradition is to our families and communities. While we were visiting Mark and his family in Germany, I would tell Fiona little stories about my day while she was away at kindergarten. She would ask me to repeat the silly little stories two and three times. It is a fun way to share the ordinary little things that happen each day.